Read for This Week’s Study: Rev. 14:6-12; Matt. 24:14; Eccles. 12:13-14; Exod. 20:2-11; Isa. 21:9; Isa. 34:8-10. Revelation shows that Satan’s end-time deception will be so successful that the world will choose to worship the beast and receive its mark. Yet, Revelation 14:1-5 tells us that God will have His remnant, those who will take their stand for the Lord when most of the world doesn’t. In the end, people will have to choose, not whether to worship or not (everyone always worships something), but rather, whom to worship. The worshipers of the beast will receive the mark on their right hands or on their foreheads, symbolic of their choice to serve this apostate system with their deeds and/or minds. At the same time, the world will witness a great proclamation of the gospel, such as has not been seen since the day of Pentecost. Before the judgments of God are poured out upon rebellious humanity, God will send His warning messages “to every nation, tribe, tongue, and people” (Rev. 14:6, NKJV). God does not want anyone to perish but all to be saved, which is why Christ’s death was for all humanity. The question is who will accept that provision and who won’t. Study this week’s lesson to prepare for Sabbath, March 9. Just before the end, God sends His warning messages, symbolically portrayed in terms of three vocal angels flying in the sky. The Greek word for angel (angelos) means “messenger”. Evidence from Revelation suggests that the three angels stand for God’s people who are entrusted with the end-time message to share with the world. Read Revelation 14:6 along with Matthew 24:14. The first angel’s message is referred to as the “everlasting gospel” (Rev. 14:6). What does describing this proclamation as “the everlasting gospel” tell us about the content and purpose of the first angel’s message? Why is this message central to all that we believe? This first end-time message is the gospel proclamation in the context of the hour of God’s judgment that has come upon the world. The gospel is good news about God, who saves human beings on the basis of faith in Jesus Christ and His work for them. The gospel is “everlasting” because God never changes. His plan was put in place even before we existed (2 Tim. 1:9; Titus 1:2). The first angel’s message includes both salvation and judgment. It is good news for those who give glory to God and worship Him as their Creator, but it also is a judgment warning for those who reject the Creator and the sign of true worship He has given - the seventh-day Sabbath. The three angels are described as proclaiming the messages with “a loud voice” (Rev. 14:7, 9). These messages are urgent and important; they must be heard by all because it concerns their eternal destiny. As such, they must be proclaimed to every nation, tribe, tongue, and people. This proclamation is particularly significant because, at the time of the end, the beast will exercise authority over “every tribe, tongue, and nation” (Rev. 13:7, NKJV). Satan’s deceptive activities, worldwide in scope, are met by the end-time proclamation of the gospel worldwide. The three angels’ messages are proclaimed by God’s people to counter Satan and his end-time allies - the dragon, a symbol of paganism/spiritualism; the sea beast, which signifies Roman Catholicism; and the false prophet, or lamblike beast, representing apostate Protestantism (Revelation 13). They will operate up through the time of the sixth plague (Rev. 16:13-14). Thus, the world is presented with two rival messages, each with the goal to win the allegiance of the people on earth. As Seventh-day Adventists, we are called to reach the world with the end-time truths contained in the three angels’ messages. What are you doing to help do just that? What more could you also be doing? Read Revelation 14:7 along with Ecclesiastes 12:13-14. What does it mean to “fear God”? How does the concept of fearing God relate to the gospel, and what does the gospel have to do with keeping God’s commandments? (See also Rom. 7:7-13). What is the connection between fearing God and glorifying Him? The call to “fear God and give glory to Him” (Rev. 14:7, NKJV) is proclaimed in the context of the “everlasting gospel”. A realization of what Christ has done for our salvation results in a positive response to Him. In the Bible, fearing God and giving glory to Him are closely related (Ps. 22:23; Rev. 15:4). Together, they designate a right relationship with God (Job 1:8) and obedience to Him. To fear God does not mean to be afraid of Him but to take Him seriously and allow His presence in our lives. God’s end-time people are the ones who fear God (see Rev. 11:18; Rev. 19:5). God desires His people to love Him (Deut. 11:13; Matt. 22:37), obey Him (Deut. 5:29; Eccl. 12:13), and reflect His character (Gen. 22:12). It is important for God’s people to give Him glory because “the hour of His judgment has come” (Rev. 14:7, NKJV). The judgment in view here is the pre-Advent investigative judgment, which takes place prior to the Second Coming. The purpose of this judgment is to reveal whether or not we are truly serving God - a choice made manifest by our works (2 Cor. 5:10). At the conclusion of this judgment, the destiny of every person is decided (Rev. 22:11), and Jesus will come to bring His reward to every person according to his or her deeds (Rev. 22:12). Judgment in Revelation 14 is a part of the gospel. To those who are in a right relationship with God, judgment is good news; it means vindication, salvation, freedom, and eternal life. However, it is bad news for the disobedient, unless they repent and turn to God by accepting this end-time, judgment-hour message. God does not want anyone to perish but all to come to repentance (2 Pet. 3:9). How could you stand, alone, in the judgment? What verdict would your life reveal? What does your answer tell you about the need for the gospel and why it is linked so closely together with judgment in the first angel’s message? Revelation shows that the central issues in the last crisis of earth’s history will be worship and obedience to God, as revealed in keeping His commandments (Rev. 14:12). The people of the world will fall into two groups: those who fear and worship God, and those who fear and worship the beast. Review the first four commandments of the Decalogue (Exod. 20:2-11). Then go through Revelation 13. How does the beast’s demand for worship (Rev. 13:7-8), the setting up of an image to the beast to be worshiped (Rev. 13:14-15), blasphemy of God and His name (Rev. 13:5-6), and receiving of the mark of the beast (Rev. 13:16-17) point to Satan’s attacks on the first four commandments of the Decalogue in the final crisis? The central concept of the first four commandments of the Decalogue is worship. Revelation indicates that these commandments will become the standard of loyalty to God in the final crisis. The final conflict between Christ and Satan plainly will revolve around worship and the first four commandments. The key issue in the final crisis is emphasized in the second exhortation of the first angel’s message. The call to “worship Him who made heaven and earth, the sea and springs of water” (Rev. 14:7, NKJV) is almost an exact quotation of the fourth commandment of the Decalogue (Exod. 20:11). This fact shows that the call to worship God the Creator is a call to Sabbath observance. Rest and worship on the seventh day - Saturday - is a special sign of our relationship with God (Exod. 31:13; Ezek. 20:12). The first angel’s message is a call to worship the Creator. “While the observance of the false sabbath in compliance with the law of the state, contrary to the fourth commandment, will be an avowal of allegiance to a power that is in opposition to God, the keeping of the true Sabbath, in obedience to God’s law, is an evidence of loyalty to the Creator. While one class, by accepting the sign of submission to earthly powers, receive the mark of the beast, the other choosing the token of allegiance to divine authority, receive the seal of God”. - Ellen G. White, The Great Controversy, p. 605. How is our view of Creation and Salvation related? Why is resting on the Sabbath as God did so important? 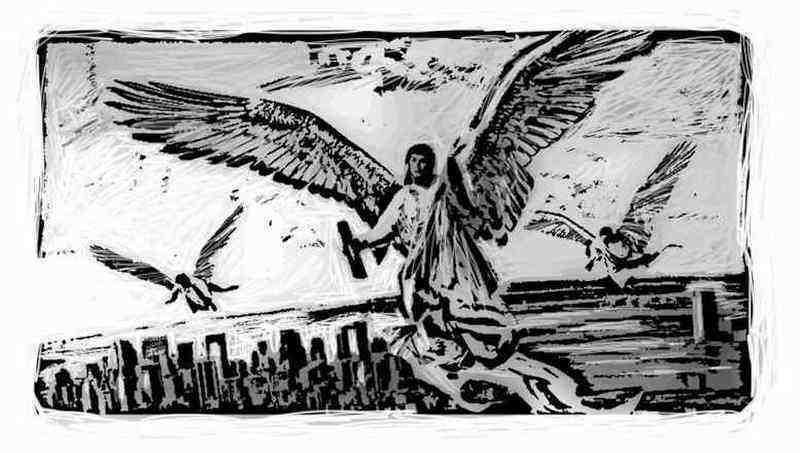 The second angel’s message announces the fall, or apostasy, of Babylon and identifies it as a false religious system. In Revelation 17:5, “Babylon is said to be ‘the mother of harlots’. By her daughters must be symbolized churches that cling to her doctrines and traditions, and follow her example of sacrificing the truth and the approval of God, in order to form an unlawful alliance with the world”. - Ellen G. White, The Great Controversy, pp. 382, 383. Read Revelation 14:8 along with Revelation 18:2 and Isaiah 21:9. The twofold repetition of the word “fallen” points to Babylon’s progressive apostasy and signifies the certainty of her full moral collapse. Babylon is described as already fallen, but her fall is also described as future. Why is that? The end-time Babylon in Revelation is a union of false religious systems that includes Roman Catholicism and apostate Protestantism. These will put themselves into the service of Satan against God’s people (see Rev. 13:11-18; Rev. 16:13; Rev. 17:5). This apostate religious union will manifest the arrogance of ancient Babylon in exalting itself above God and will seek to take His place in this world. The message of the second angel warns God’s people that this wicked system will depart further and further from the truth in consequence of her refusal of the light of the end-time gospel message. Only when “the union of the church with the world shall be fully accomplished throughout Christendom, will the fall of Babylon be complete”. - Ellen G. White, The Great Controversy, p. 390. Read again Revelation 14:8 along with Revelation 17:2 and Revelation 18:3. How does Babylon make the world drink of the wine of her fornication? What does this wine symbolize? Revelation 17 pictures end-time Babylon as a harlot making people on earth drunk with her wine of immorality (Rev. 17:2). The wine of Babylon refers to the false teachings and false gospel offered by this apostate religious system. Today, as many Protestant churches, in fulfillment of Bible prophecy, rapidly erase the differences that once separated them from the Roman Catholic Church and turn away from biblical truth, we witness the corrupting influence of Babylon’s wine amongst the professed body of Christ: theistic evolution, which is implicitly contrasted with the reference to Creation in the first angel’s message; theological traditions replacing sola Scriptura; revised ethics abandoning biblical definitions of gender, marriage, and so forth. Intoxicated people cannot think clearly. As the people become spiritually inebriated by Babylon’s wine, Babylon will seduce them into worshiping the sea beast and receiving the mark of the beast. How does Revelation 14:12 depict God’s faithful people? In contrast to God’s faithful people, Revelation 14:9-10 warns about the fate of those who face God’s wrath. In the Old Testament, the outpouring of God’s wrath is described symbolically as drinking wine from a cup (Jer. 25:15-16). The severity of the judgment upon the worshipers of the beast is expressed as drinking the wine of the wrath of God that is poured out “without mixture” (Rev. 14:10) into the cup of His indignation. In ancient times, people often diluted wine with water to reduce its intoxicating strength. But the wine of God’s wrath is described as “unmixed” (akratou). The unmixed, undiluted wine represents the pouring out of God’s wrath in its full strength, without mercy. Read Revelation 14:10-11 along with Revelation 20:10-15. How do Isaiah 34:8-10 and Jude 7 shed light on the statement: “And the smoke of their torment ascends forever and ever” (NKJV)? The statement of the torment with fire and brimstone refers to total destruction. Fire and brimstone is a means of judgment (Gen. 19:24; Isa. 34:8-10). The ascending smoke of destruction is a well-known image in the Bible. Isaiah prophesied of the future destruction of Edom by fire and brimstone: it will become a burning pitch; “it shall not be quenched night or day; its smoke shall ascend forever” (Isa. 34:10, NKJV). Jude describes the fate of Sodom and Gomorrah as suffering the punishment of “eternal fire” (Jude 7). These texts do not talk about endless burning, for none of these cities is burning today. The consequences are eternal, not the burning itself. The “eternal fire” in Revelation refers to annihilation; the burning will be long enough to make the consumption complete until nothing is left to burn. Although we can be thankful for the great truth that the fires of hell don’t torture the lost for eternity, the punishment is still terrible enough. What should the permanence and the severity of the punishment tell us about the sacred task we have been given to warn others about what is coming? Further Thought: Read Ellen G. White, “The Final Warning”, pp. 603-612, in The Great Controversy. Revelation shows that at the time of the end, God’s people are commissioned with the proclamation of the end-time gospel to the world. The work before us seems daunting, all but impossible. However, we have the promise of God’s power. The message will be carried not so much by argument as by the deep conviction of the Spirit of God. The arguments have been presented. The seed has been sown, and now it will spring up and bear fruit”. - Ellen G. White, The Great Controversy, pp. 611, 612. The conclusion of the proclamation of God’s final message will result in a great separation that divides people in the world into two camps: those who love and obey God and those who follow and obey the beast. This separation is portrayed in terms of two harvests: the gathering of the wheat into the storehouses (Rev. 14:14-16) and the grapes to be trampled in the winepress (Rev. 14:17-20). This final separation is the subject of Revelation 17 and 18. Think about the question of the Sabbath in the context of final events. The issue is: Whom will we worship - the Creator of “the heaven and the earth” (Rev. 14:7, NASB), or the beast power? The Bible teaches that the seventh-day Sabbath is the oldest (Gen. 2:2-3), most foundational sign of God’s creatorship of “the heaven and the earth”. What does that truth teach us about why the Sabbath, as one of God’s commandments (Rev. 14:12), plays such a prominent role in the final crisis? Seventh-day Adventists took a boat cruise to share health tips in central Russia - and the boat’s captain quit smoking. Children wrote letters about the Ten Commandments to give away on Russian streets. Evangelistic meetings gave power tools to people whose homes were damaged in conflict-torn eastern Ukraine. These are among the innovative ways that church members are sharing the gospel across the Adventist Church’s Euro-Asia Division, a territory covering much of the former Soviet Union, in an effort to jump-start membership growth, which is largely flat. “It’s a challenging territory, but God is working through Total Member Involvement”, said division president Michael Kaminskiy (pictured). Eleven Adventist health professionals went on a two-week boat cruise to ancient Russian cities on the Volga River. The trip, which followed a popular tourist route, was organized by a Russian nongovernmental health organization, and the Adventists were invited to share health principles about water, sunshine, exercise, and rest, as well as conduct stop-smoking classes. The boat’s captain, who smoked heavily, attended the classes. “He smoked so much that there was always a cloud of smoke around him”, said Ivan Velgosha, president of the West Russian Union Conference. By trip’s end, he had stopped smoking and made the boat a smoke-free zone. The Adventists presented him with a book about healthy living and told him that Jesus could help him never smoke again. More than a month after the trip, the captain still hasn’t smoked, Velgosha said. In the city of Nizhny Novgorod, schoolchildren shared their love for God by writing letters about His law. One child wrote, “We need to remember the third commandment so we don’t say bad words about God.” Another child wrote, “If people stopped stealing, we would be the richest country in the world.” The children spent five days passing out the handwritten letters on city streets. In eastern Ukraine, church members have found that free drawings for electric drills are drawing men to evangelistic meetings. Women were coming to the meetings, but the number of men in attendance sharply increased when churches began to advertise the electric drills, said Stanislav Nosov, president of the Ukrainian Union Conference. “Men need tools to repair homes damaged in the conflict”, he said. Daily drawings were held at two-week evangelistic meetings conducted in several towns in eastern Ukraine. Winners chose between a drill and a set of pots, while anyone who attended seven meetings in a row received a food package with macaroni, sugar, milk, and other basic items. Dozens of people have been baptized. 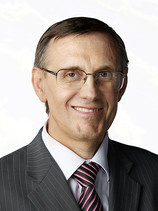 “God is doing wonderful things through Total Member Involvement”, Kaminskiy said.